Collecting great articles for my COMM 563 paper on Twitter‘s effects on Collective Intelligence. 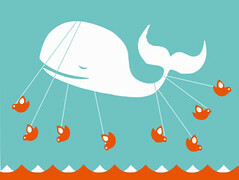 via Pew Internet: Twitter and status updating. A while ago, I wrote about the launch of Nerd Merit Badges, to be worn by people who want to show off their geeky achievements. The first one was for folks who have contributed to an Open Source software project. via New nerd merit badge: Inbox Zero – Boing Boing. Some old media are embracing new methods, including openness and portability of data, such as the Washington Times. This is big. The Washington Times has always focused on content. After careful review, we determined that the best way to have the top tools to produce and publish that content is to release the source code of our in-house tools and encourage collaboration. The source code is released under the permissive Apache License, version 2.0.
via Open Source – The Washington Times – Home. This is an interesting story considering the copyright issues that are being brought into the spotlight by bottom-up creators and convergence in general. I’m an avid supporter of creative commons licensed media, and so I don’t really see the threat of this affecting me directly as a content producer, but I can certainly see those who want to abuse or abuse copyrighted material being potentially upset by this. In the middle, though, there are the people who want to simply make a copy of a DVD they bought as a backup, which many of these legal representatives might have a big problem with, and that does concern me. Moreover, freeing media is definitely something I’m for as a consumer. DSLReports notes that Obama’s own ethics rules would prohibit these appointees from directly working on copyright issues, as they previously represented the entertainment industry in these cases, but it is somewhat disconcerting that the Obama administration would pick so many industry insiders for these positions. We would have hoped that the administration had chosen a set of appointees with a more progressive attitude towards copyright. via Obama’s Latest Pick for DOJ is RIAA Lawyer Who Killed Grokster and Sued Jammie Thomas – ReadWriteWeb. One of the great things about this administration, so far, is the transparency, willingness to admit when something’s wrong, and the effort to communicate, then move to correct. It shows an element of leadership that is often overlooked, and seldom practiced: humility. It is also a macro example of how we can act in our own lives. via ABC News: Obama Admits Embarrassing Day for Administration. I found the focus on Community to be extremely interesting in this chapter, because in my quest for leadership opportunities, I have begun this year to pursue a leadership role in my neighborhood as a captain in the my neighborhood’s Community Group. I feel like I’ve been doing all of the right things: I advertise in a few different ways. I gathered feedback about what it was that people wanted out of the group. I established a regular meeting schedule with a neutral, comfortable space. I arranged for speakers. I developed and maintain a web site. I made phone calls and emails and mailing lists and committed myself. I drafted a strategic plan, vision and goals for the group, and got it approved, though not by a quorum, which is the key issue: attendance. Despite 400+ homes in our neighborhood, we struggle to get 15 people to attend each month. This chapter on community gives me some solace. It talks about the needs of community: to invent the processes that allow people to live together, such as mediation. “Community members struggle with the traditions that bind them and the interests that separate them in order to realize a future that is an improvement upon the present” (Moore, 1996, pp. 198-199). I have found that our largest attendance numbers occurred right after something negative has happened in the community, such as a robbery or car theft. When these issues arise and there is a neutral or quiet response from police or other officials, we look to those around us who shared in the experience in order to help us make sense of it. I’m starting to think that our meeting schedule could become less frequent and perhaps we could begin performing mediations instead of simply meeting to review the police blotter. According to the strategic plan, the neighborhood wants a group that can help us to watch out for each other, perform our civic duty, and celebrate the beauty of the space where we live. Mediation might be a great way to provide some of those goals. Moore, C. M. (1994). Why Do We Mediate? In J. P. Folger & T. S. Jones (Eds. ), New Directions in Mediation: Communication Research and Perspectives (pp. 195-203). Sage Publications, Inc. In this chapter, Mediation as a process is described and introduced, much in the same way we do in a very abridged way in the beginning of a mediation session. The ideal role of the mediator as facilitator, empowerer, and face manager (not judge) is described. The benefits of mediation, including convenience, effectiveness, preventative nature, relationship preservation and redefinition, and confidentiality are discussed, if in a somewhat biased way. The types of mediation are also discussed. At the end of the chapter there is an interesting exercise which asks us the look at one definition of mediation, and to dismantle it in order to see what aspects of the process are lost when those definitive elements are removed. Mediation: A confidential, voluntary process where a neutral third party facilitates negotiation between two or more parties with mutually acceptable agreement as one possible outcome (Domenici, et al., 1991, p. 43). Without confidentiality, mediation could be embarrassing, fear generating, or hurtful to disputants. Without being voluntary, mediation generated agreements might be less likely to hold. Without neutrality, the mediator could have a powerful influence on outcomes they themselves want. Without facilitation, mediation could degrade into chaotic name calling. Without all parties present, mediation could reinforce barriers between disputants. Without mutually acceptable agreements, they will be less likely to be actually agreed to by all parties. With mandated agreements, disputants might be unwilling to accept outcomes.